brands are actually manufactured abroad, while some foreign brands have built a manufacturing presence in local markets. 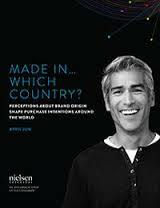 And some global brands have been in a market so long that many consumers actually perceive them to be local. Nonetheless, brand origin can be an extremely valuable asset for both global and local companies.